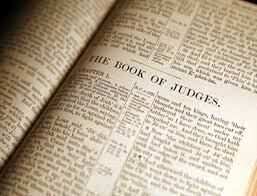 Over a year ago in our previous church I teamed up with one of the other Pastors to preach through the book of Judges. In our newly planted church, Reformed Baptist Fellowship of the Albemarle, we are nearing the conclusion of our preaching through the book of James and I have thought of picking back up in Judges from the first verse. This has brought to memory several lessons I learned in my initial studies of the wonderful book of the Old Testament. One verse is repeated several times in this book that continues to haunt my thoughts: "...Every man did what was right in his own eyes" (Judges 21:25b). The three other verses where this phrase occurs in Judges (17:6; 18:1; 19:1) are all preceded with the phrase "...there was no King in Israel". The demise of the Jews during this time in their history is equated to the refusal to acknowledge God and turn to their own clever devices to live as they pleased. Without a godly leader to guide the people they placed themselves as the only authority for how they should live their lives. The people believed they had a better way of functioning and living other than that which God had specifically prescribed to them, they continued to falter with each generation suffering from sin effects of their parents. When they repented, God would hear their cries and rescue His people but the following generation would themselves turn from God and spiral even further into sin than their predecessors. Although God had revealed His will for the people in His Word, they turned from His guidance to seek what they believed to be a justifiable alternative. In today's church culture we see such approaches to ministry. People with noble intentions devise numerous approaches and methods of ministry citing statistics and research to justify their ideas. Christian publishing companies abound with material created as a result of these approaches. While you will find Scripture peppered throughout their pages, most are inserted after the method is devised and not as the basis for said method. Among these exist age-segregating ministries such as Youth ministry, children's church, nursery, and age-graded Sunday School. These are a regular staple in our churches today and it would in fact be uncommon to actually walk into a church and not find them. Such a church not having these types of ministry would seem archaic and would eventually be encouraged by others to update their view of ministry and functionality of the church. But this approach is a relatively new invention. Rewind to the previous church generation and while you would still find such ministries they would exist with much less regularity. Rewind a few more generations and we would see an even more sparse occupation and placement of age-graded ministries comparative to today. Continue going back a little further into church history and you quickly arrive to the point where such ministry approaches were completely absent. In such churches families were not only expected to gather together in the corporate meetings of the local church but if they did not the fathers of such families were lovingly held accountable for not leading their homes in a biblical manner. How have we arrived at the point where it is expected that children are ushered out of the corporate gathering of the church and the youth are corralled together under the supervision of someone who, although unknowingly at times, subverts the authority of their parents? Because many have sought to do what is right in their own eyes and created methodologies starting with desired results as the foundation and not Scripture. I am of course not equating the deliberate, sinful intentions of the people in the book of Judges to those involved in age-segregated ministries, but the underlying principle remains the same. When Scripture is abandoned, we have no foundation on which to stand other than our own ideas. Pragmatism prevails and biblical sufficiency slides through our fingers. Another element is crucial in understanding how we could arrive at this point as well. As the book of Judges reveals, the absence of a leader seeking after God's face (Proverbs 27:8) resulted in a people who were self-led and did what each saw to be valid based on their own ideals. Such a leader would have been there to remind them of the Scriptures and the God who so graciously saved their forefathers from slavery in Egypt bringing them into the Promised Land. Such a leader would have sought to curtail the self-interest teaching that robbed the people of God's guiding words. Such a leader would have forsaken the surrounding culture and world's methods in order to pursue God's design for His people. Where are those leaders today? Where are the men of God who will cast off cultural relevance and vain philosophies and proclaim what God has ordained? Where are the leaders of our churches who will stand in the pulpits and say "No more...let God's Word be our authority and nothing else"? Can we stop this trend and return our people back to the sufficiency of Scripture? Yes, but only if we humble ourselves and willingly admit our failure to seek God's guidance in this area. Let us rise up men and proclaim the Word as sufficient. Let us not devise methods which are merely "christianized" copies of secular ideas. Let us desire the Word of guide as our guide in life. May we seek to return our churches, our families, and ourselves back to the Word. May seek to do what is right in the sight of the Lord and not in our own eyes.